Check out these 17 fun ways to gift wine. Perfect as a Holiday gift or fun Holiday Party! It’s the Holidays which means we’ll all be bringing that special gift. It’s always hard to figure out what to give the person who has it all. Or that picky person that you just can’t figure out. One fun gift most people love receiving is a bottle of wine. Whether it’s a favorite bottle, or a new flavor you want others to try out bringing the wine is just half the fun. Check out this fun round up of ways to gift wine. This list is full of some fun ideas, labels, tags and more. Perfect for giving that wine bottle that special gift. So head below and check out how easy and fun wine gifting can be! Gotta show these to my friend who makes his own wine! The little wine sweaters are super adorable! Omgosh I love the little sweater covers!! How adorable and so gorgeous for winter!! Would be hilarious as ugly sweaters!! 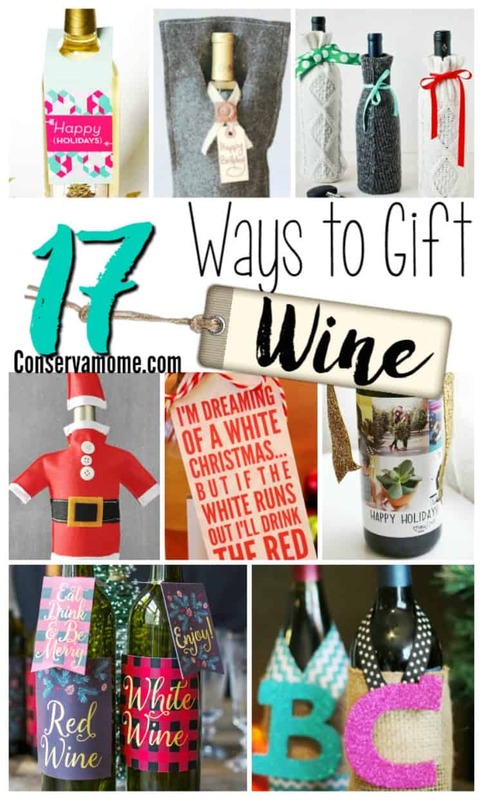 My MIL loves wine – this is a great group of ideas for dressing up gifts for her. These are some really cute ideas! I like the sweater sleeve and Christmas wine bottle labels. So many great ideas.